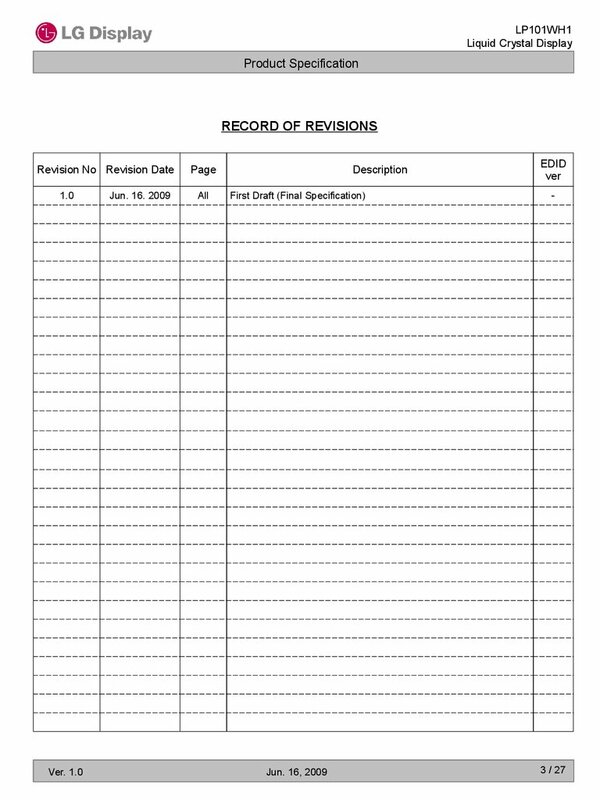 The following are maximum values which, if exceeded, may cause faulty operation or damage to the unit. Note : 1. 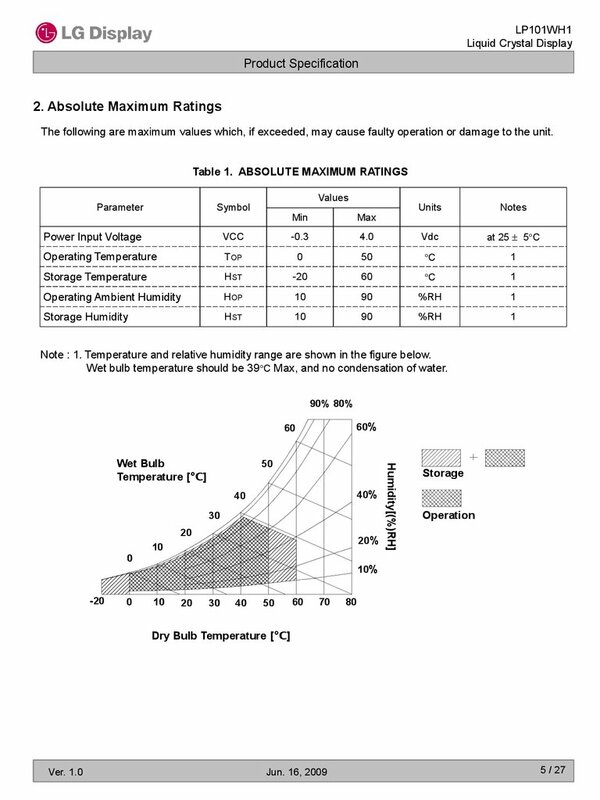 Temperature and relative humidity range are shown in the figure below. Wet bulb temperature should be 39 C Max, and no condensation of water. 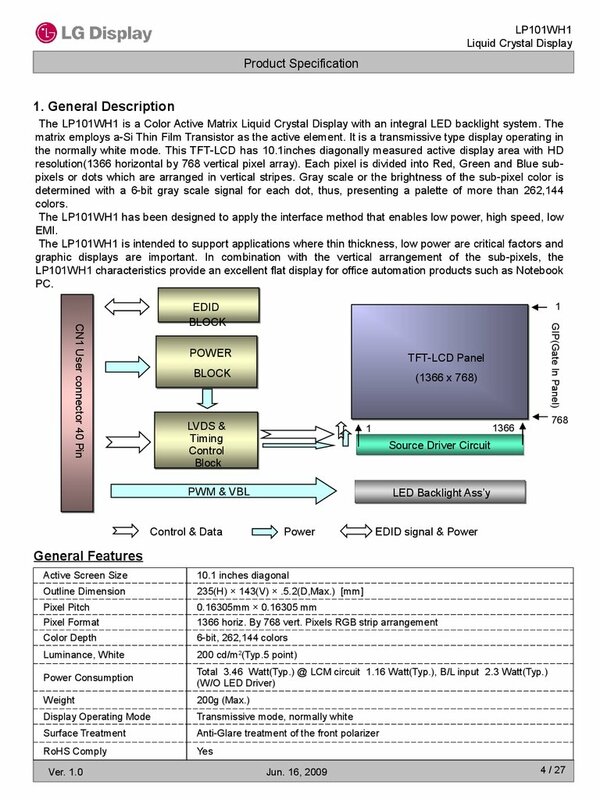 TFT array and liquid crystal. The second input which powers the LED BL. whereas Mosaic pattern is displayed and fv is the frame frequency. 2. 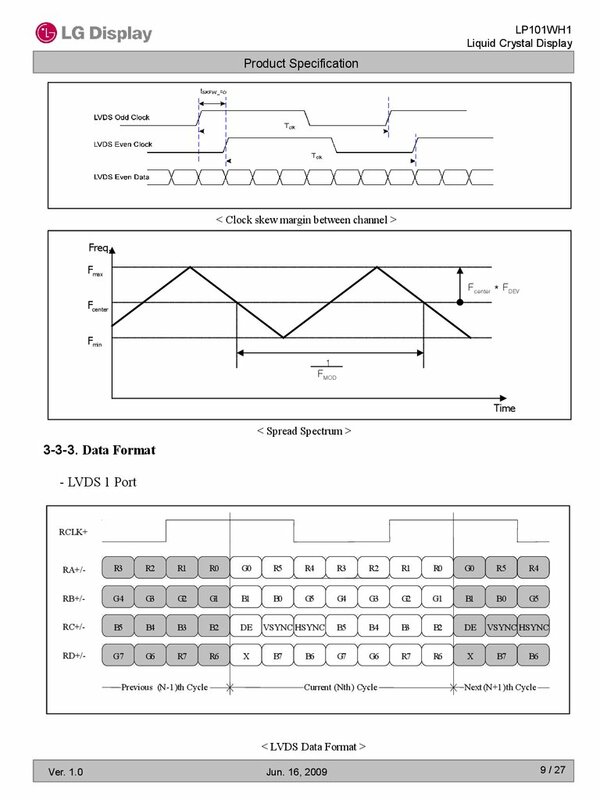 This impedance value is needed to proper display and measured form LVDS Tx to the mating connector. 3. 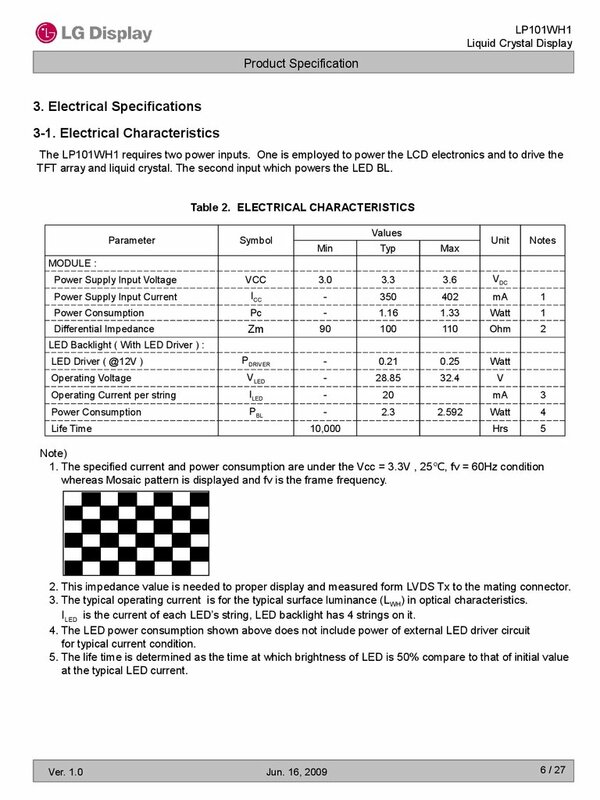 The typical operating current is for the typical surface luminance (L WH) in optical characteristics. ILED is the current of each LED’s string, LED backlight has 4 strings on it. 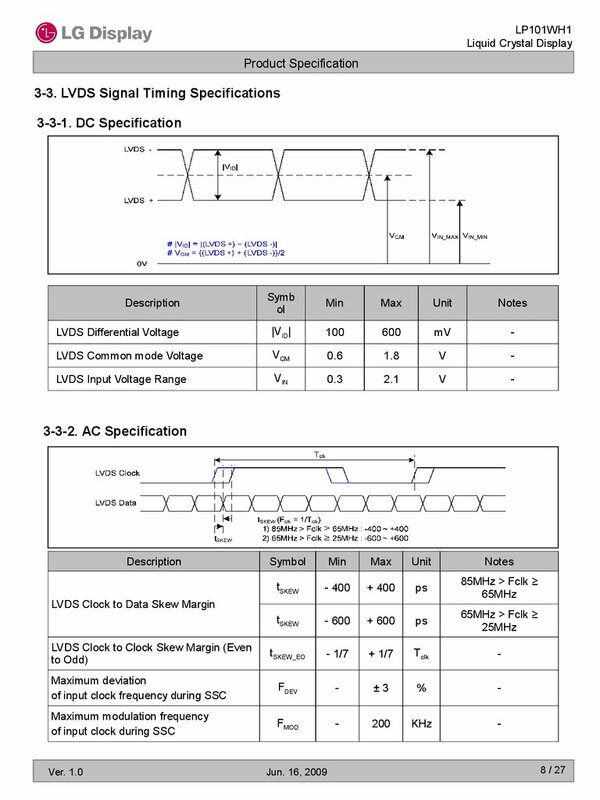 at the typical LED current. 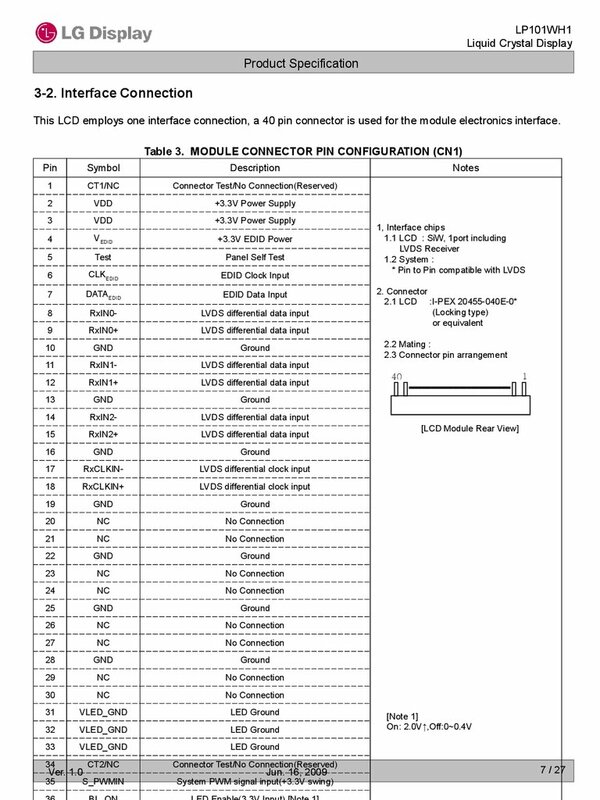 This LCD employs one interface connection, a 40 pin connector is used for the module electronics interface. 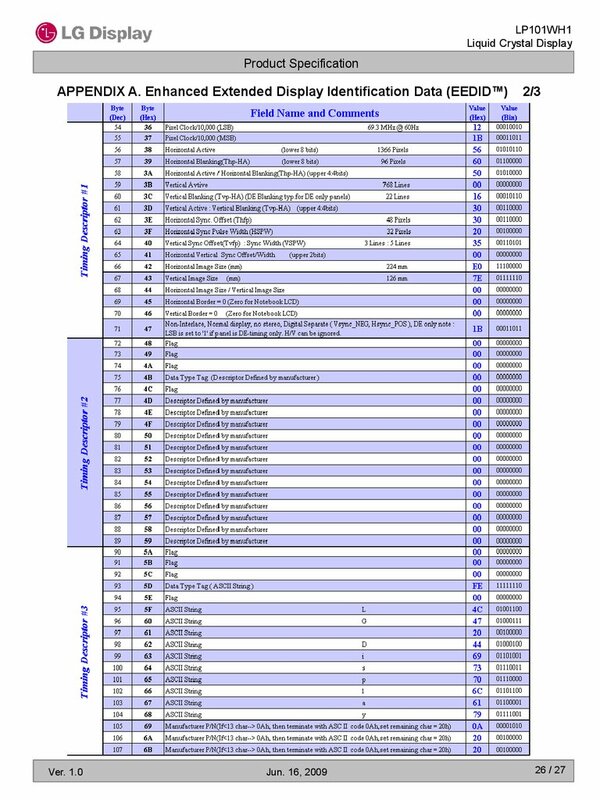 satisfied with the following specifications and specifications of LVDS Tx/Rx for its proper operation. 2. Please avoid floating state of interface signal at invalid period. 3. When the interface signal is invalid, be sure to pull down the power supply for LCD VCC to 0V. 4. 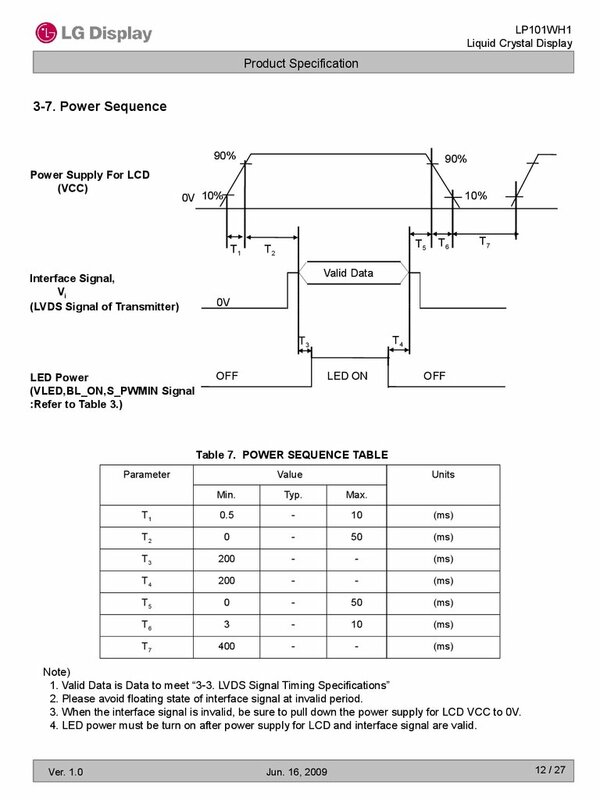 LED power must be turn on after power supply for LCD and interface signal are valid. at a viewing angle of and equal to 0 . FIG. 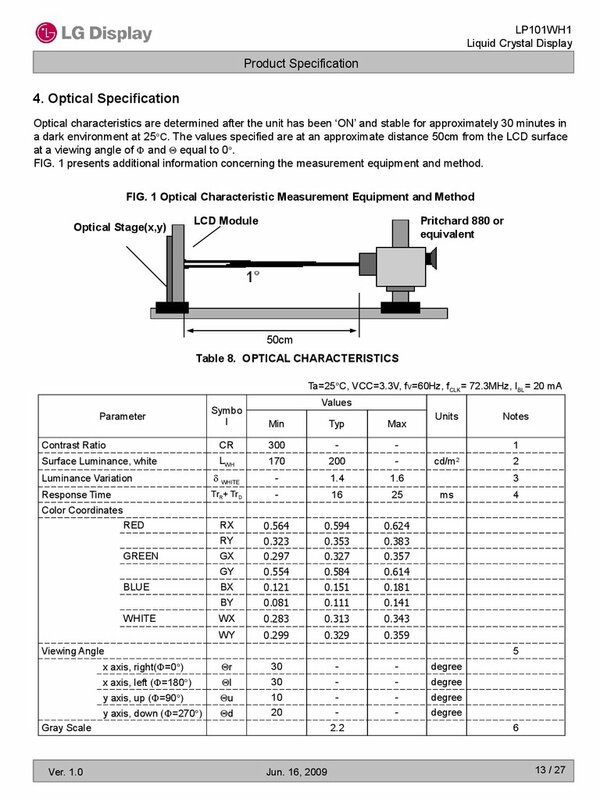 1 presents additional information concerning the measurement equipment and method. all pixels displaying white. 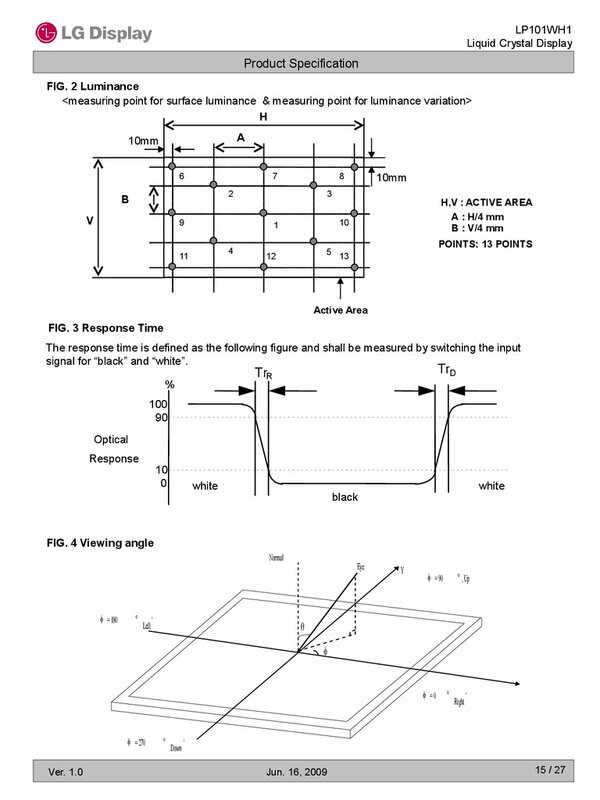 For more information see FIG 1.
at each test position 1 through 13 and then defined as followed numerical formula. 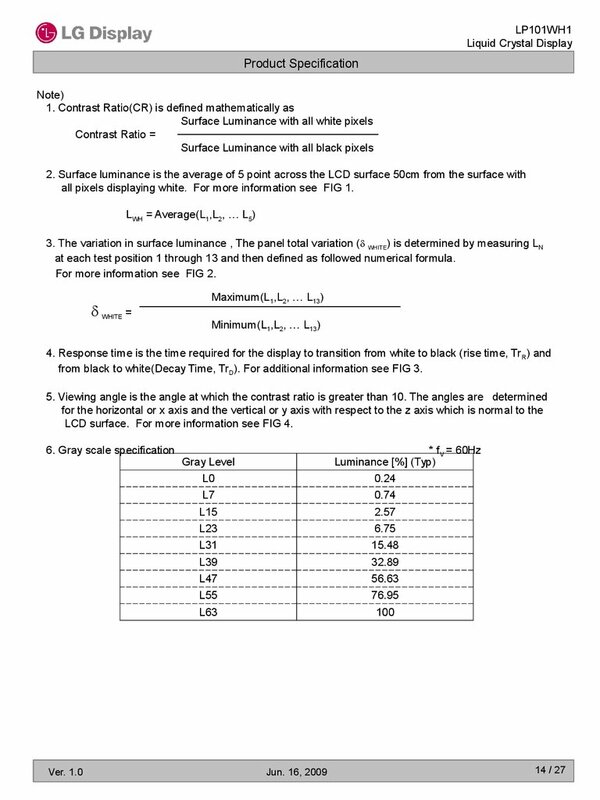 For more information see FIG 2.
from black to white(Decay Time, TrD). For additional information see FIG 3. 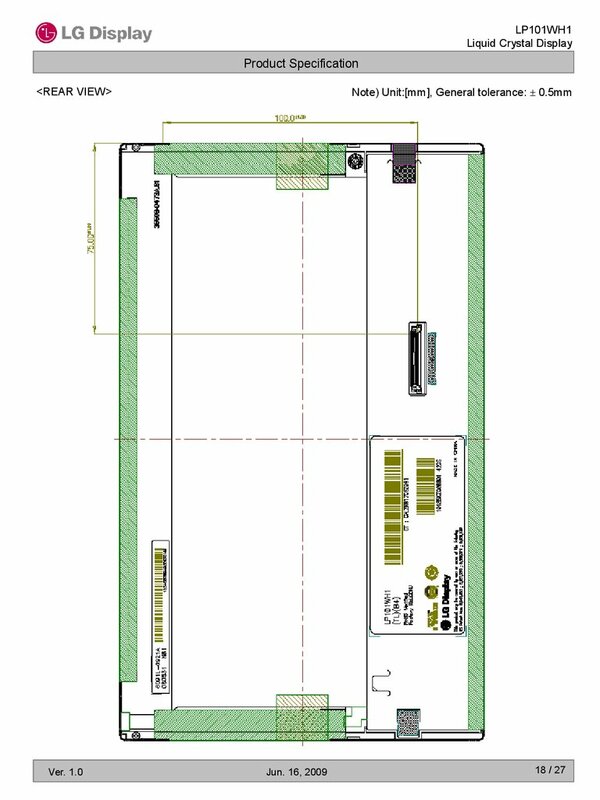 LCD surface. 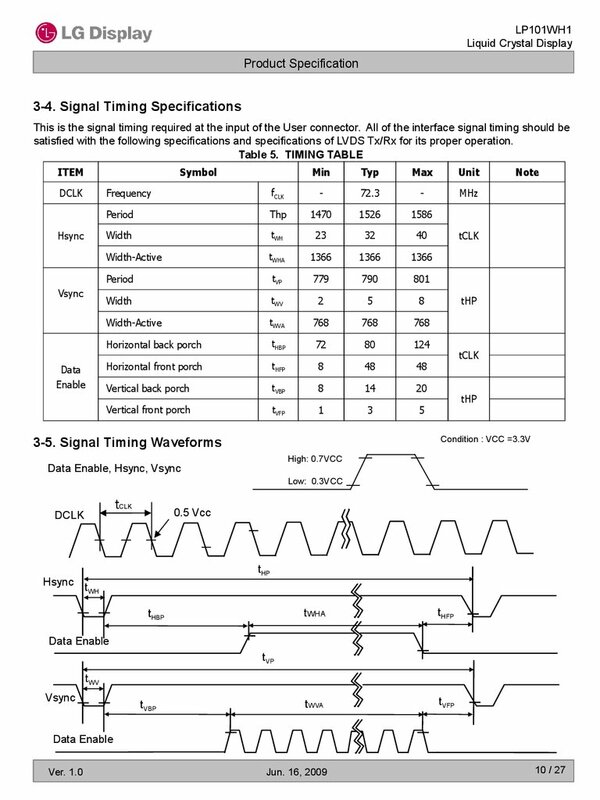 For more information see FIG 4.
signal for “black” and “white”. 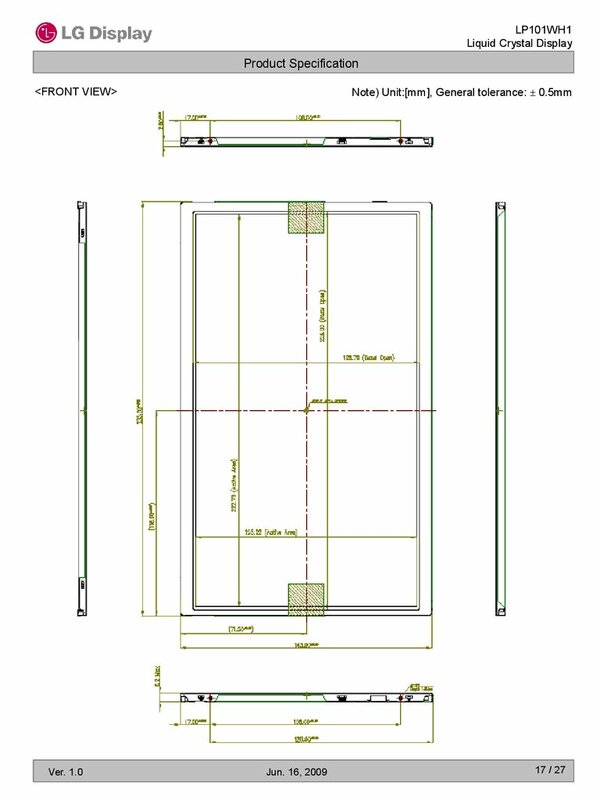 in the next page are detailed mechanical drawing of the LCD. 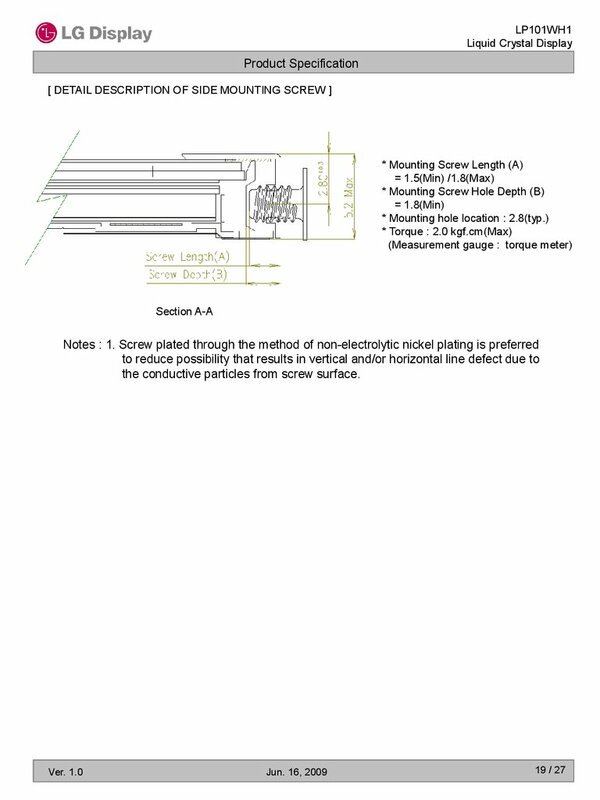 the conductive particles from screw surface. 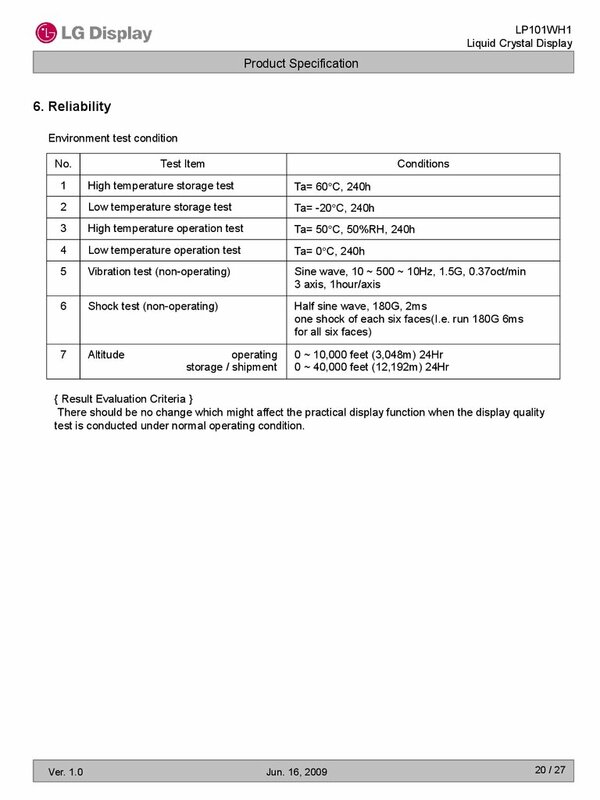 test is conducted under normal operating condition. 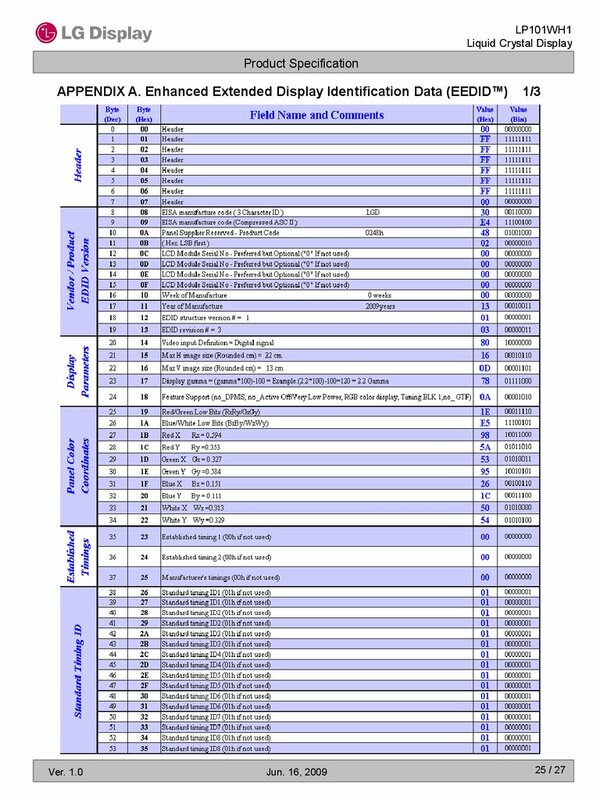 Standard for Safety of Information Technology Equipment. 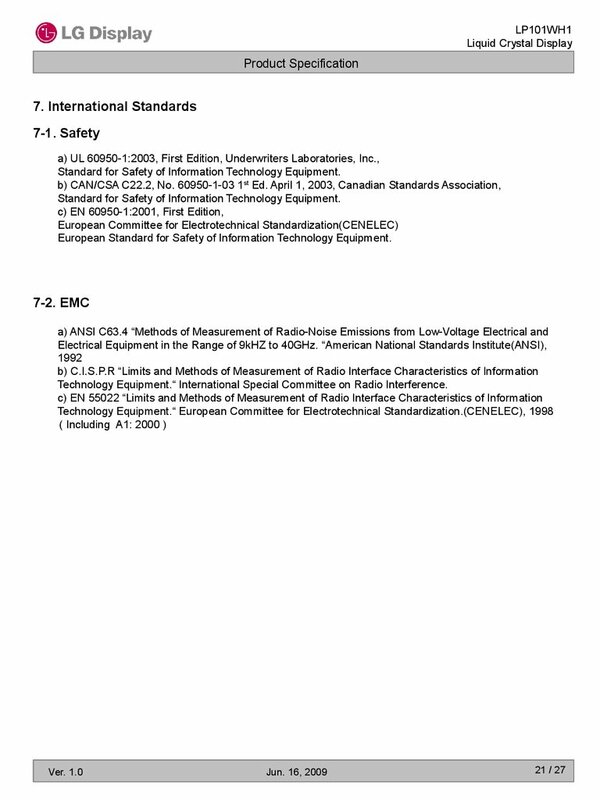 European Standard for Safety of Information Technology Equipment. 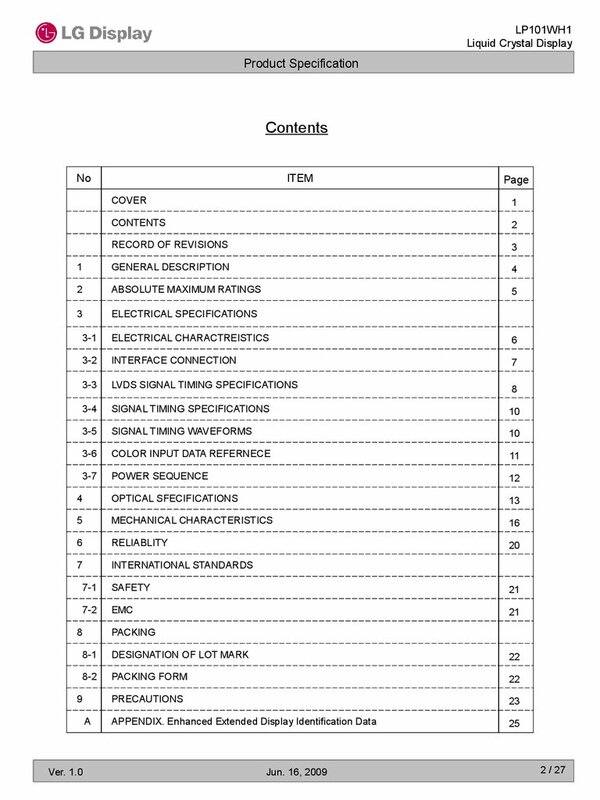 Technology Equipment.“ International Special Committee on Radio Interference. F ~ M : SERIAL NO. Serial No. is printed on the label. The label is attached to the backside of the LCD module. This is subject to change without prior notice. 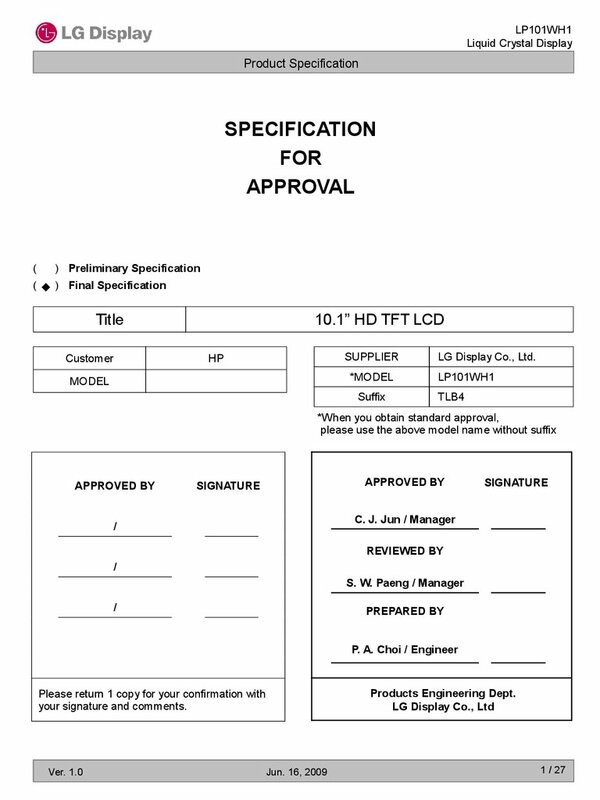 Please pay attention to the followings when you use this TFT LCD module. (1) You must mount a module using holes arranged in four corners or four sides. force is not transmitted directly to the module. (3) Please attach the surface transparent protective plate to the surface in order to protect the polarizer. Transparent protective plate should have sufficient strength in order to the resist external force. 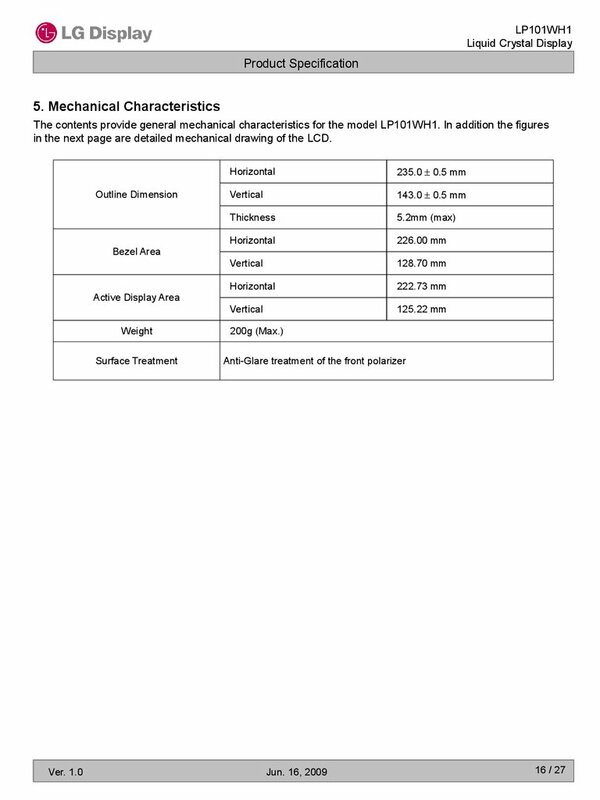 (4) You should adopt radiation structure to satisfy the temperature specification. pencil lead. And please do not rub with dust clothes with chemical treatment. chemical damage to the polarizer. 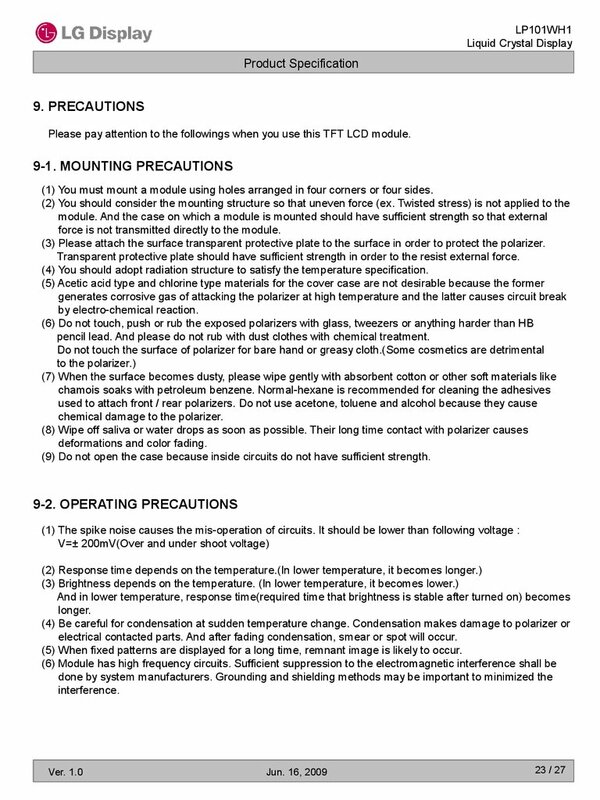 (9) Do not open the case because inside circuits do not have sufficient strength. electrical contacted parts. And after fading condensation, smear or spot will occur. (5) When fixed patterns are displayed for a long time, remnant image is likely to occur. treatment persons are connected to ground through wrist band etc. And don’t touch interface pin directly. 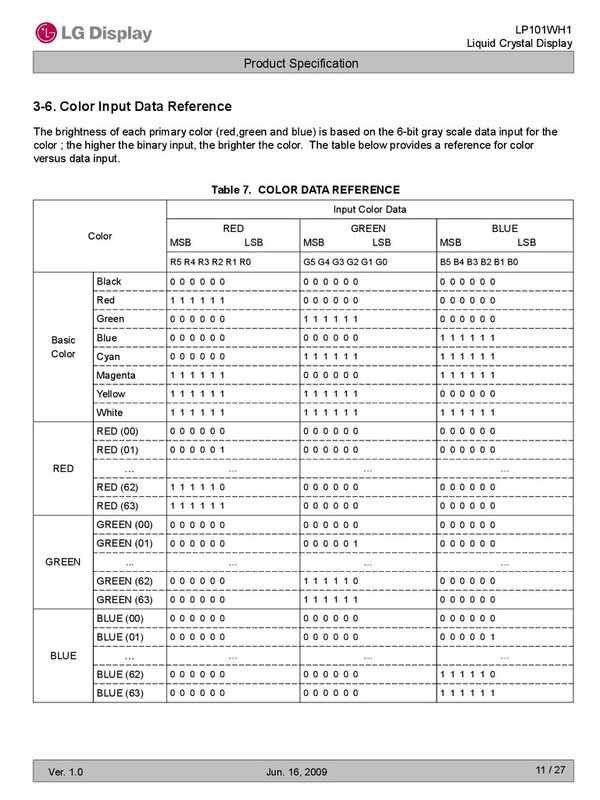 Strong light exposure causes degradation of polarizer and color filter. When storing modules as spares for a long time, the following precautions are necessary. temperature between 5 C and 35 C at normal humidity. (2) The polarizer surface should not come in contact with any other object. 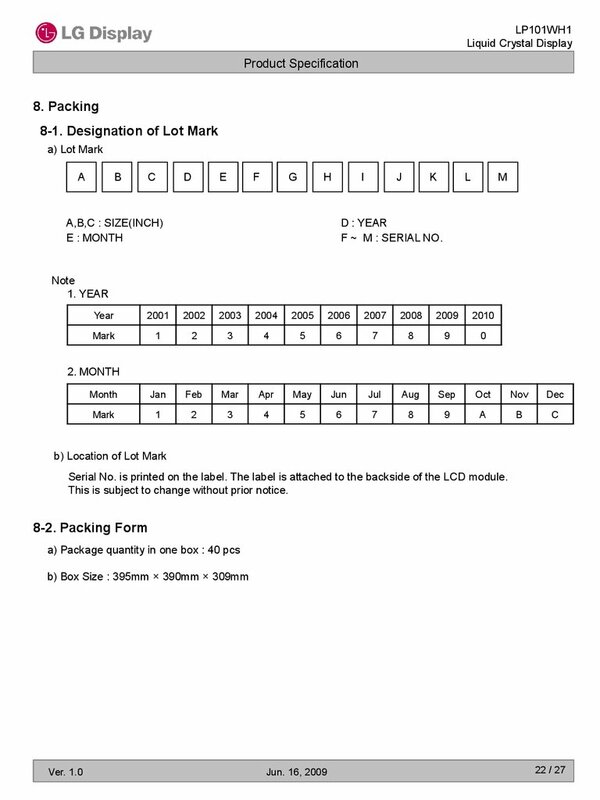 It is recommended that they be stored in the container in which they were shipped. 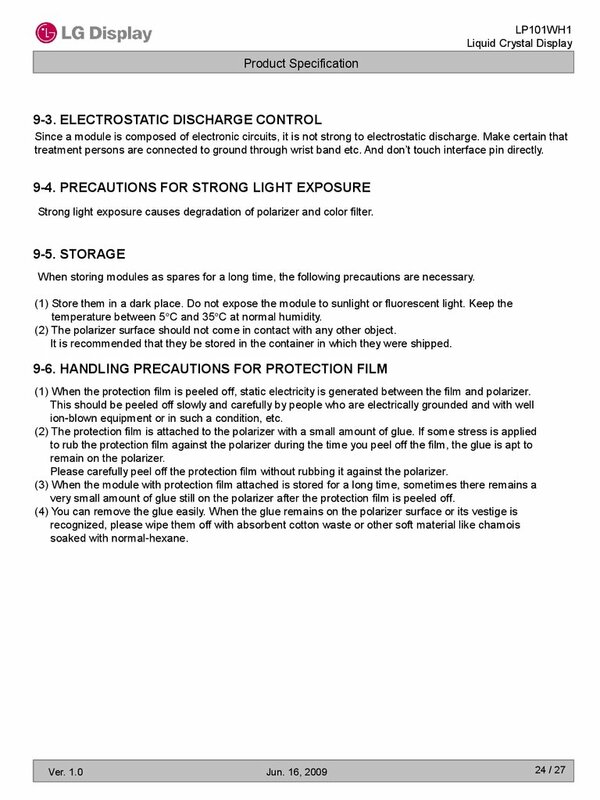 (1) When the protection film is peeled off, static electricity is generated between the film and polarizer. ion-blown equipment or in such a condition, etc. Please carefully peel off the protection film without rubbing it against the polarizer. very small amount of glue still on the polarizer after the protection film is peeled off.